It’s still a few weeks before the release of the gay sci-fi romance, Machine Metal Magic, but in the meantime you can enjoy a new prequel story. Meet Jaime and get a taste of this futuristic universe where humanity is tough and scrappy, living among the stars and avoiding the killer A.I.s that drove them from Earth. It’s free to download when you sign up to my newsletter. Xin is a bounty hunter used to capturing his targets, but he may have met his match in Jaime. A young man with unique powers, Jaime is on the run from forces larger than either of them. On a distant world, far in the future, these two men will have a night of adventure neither will soon forget. 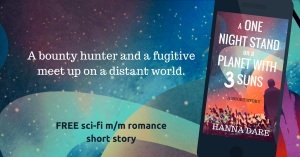 Please enjoy this prequel story to the gay science fiction romance, Machine Metal Magic by Hanna Dare. This 8000 word m/m story contains sexytimes and a good deal of snark.